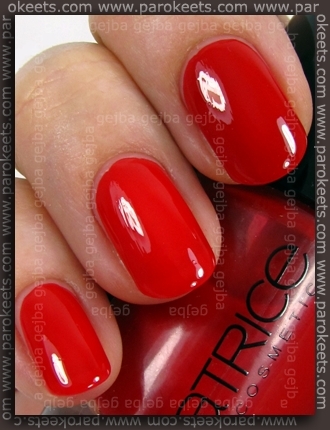 Photo for our reader kokola who wondered how similar is Catrice Bloody Mary To Go to Essence Jelly Baby LE Cherry Juice polish. I added Essence SYF Hot Red to represent a little bit cooler red shade (with creme finish) than other two but still with in the same family tree. Cherry Juice is slightly darker and with little bit more blue than Bloody Mary To Go which leans a little bit more to the neutral side. Cherry Juice and Bloody Mary To Go are both jelly finishes, so the nail line is still a little bit visible after two coast. I added one layer of top coat. Catrice brush wins hands down over the Jelly Baby one. Can you please specify the shade of the darkest red nail polish on the picture? As I understand it, it is the Essence Show Your Feet in Hot Red, but on some other swatches on the Internet, the color is much brighter, so I’m a bit confused. It is Essence Show Your Feet Hot Red as it looks like in lightbox. In essence that means that this is approximate color this polish has inside, but in the sun it is few shades lighter. The Catrice is gorgeous! Love that red! I like me some jellies! Nice comparison, Catrice is a winner for me. I looooove their new core line of polishes and the brush is great indeed. .-= Tassa´s last post … Avon Cherry Jubilee Konad =-.